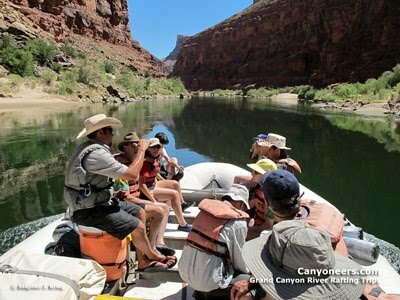 Canyoneers Grand Canyon River Trips: "Keep It Clean!" "Grand Canyon. I love this place. Keep it clean!" Thus our Trip Leader, Brandon Green, summarized his attitude toward river rafting through the Canyon. It was May 30, 2010 and the start of Brandon's 86th Grand Canyon river trip for Canyoneers. He was leading a two boat trip, with Pilot Jacob Snyder in charge of the second boat. Some of the passengers would be doing "All the Grand", a 7-day, 6-night motorized raft trip of the entire Canyon, from Lees Ferry to Lake Mead. Other passengers were doing our 3-day Upper Grand trip, and would hike from the river to the South Rim on their last day, their seats being replaced by passengers hiking down from the rim to do the lower two thirds of the Canyon, which we call our "Best of the Grand" 5 day motorized trip. All Grand Canyon river rafting trips begin at historic Lees Ferry on the Colorado River. Lees Ferry is located downstream from Glen Canyon Dam (Lake Powell), at the upper end of the Marble Canyon portion of Grand Canyon. The spectacular walls of Marble Canyon rise straight up for about 500 feet there, but they wouldn't be that, uh, short for long. Because the further down the river you go, the higher the canyon walls get. Much, much higher. The smooth water downstream from Lees Ferry is the perfect opportunity for the river guides to give further orientation to the passengers about how things are run on the boat. The focus of the guides is: Safety, comfort, and fun for all their passengers. Soon it would be time to run our first significant rapid on the Colorado River.